Another successful day and back on the mornings . One of the fastest charter boats on the east coast. 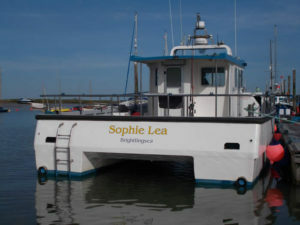 With twin 315 HP NEF turbo diesels 630hp total, for safety and top speeds of just under 24 knots, cruising speeds of 16 knots twice the speed of many charter boats & halving offshore trip steaming times, extending your angling day and with twenty five years expearience from Brightlingsea as the leading charter boat skipper and now with this superb cat with its outstanding stability and masses of space its an umbeatable package. Personnel have the comfort of sheltered seating in the heated warm air crew cab, on deck toilet facilities , this boat is also equipped with some of the most modern electronics available including classB, AIS, generator 240v ,transponder, Garmin Colour touch screen fish finders & Plotters forward looking sonar’s, , Satellite navigation, Colour Garmin radar overlay ,With a mass of comfortable deck space, a walk around island wheel house for crew safety. Its exhilaratingly faster, with more space, more comfort, safer with twin engines, increasing your days enjoyment. Its your day out so why compromise with any old out of date, slow charter boat or an undersized boat were your crammed in shoulder to shoulder which could be embarrassing if its a corporate day out or your entertaining clients. So why not book this fantastic cutting edge boat for around the same price or less? Its exhilaratingly faster, with more space, more comfort, safer with twin engines, increasing your days enjoyment and you don’t have to spend a penny in a bucket with an on deck toilet available or get soaking wet before you start fishing. Offshore marks in the summer take no time at all to reach, these productive marks ten to twenty miles off could take hours in a slower charter boat or even eliminate them from getting there wasting your fishing time, and as we all know time is a precious thing, especially fishing time. Have you been subjected to being taken out by a charter boat in bad weather and stuck in the river with no fish? Just so the skipper can grab your money!!! I bet you have, well we will give you the customer our honest professional opinion of weather sea state & fishing and the decision is then yours. 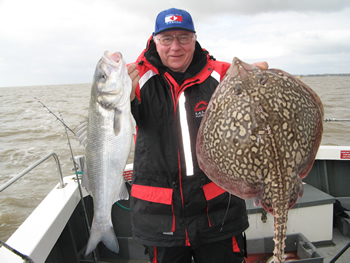 So if you want a great Boat Fishing experience make sure you book a trip with us. Spaces or party dates for weekends in October are all gone now but we still have some weekend dates in November for the 5th & 19th and December 3rd 9th 10th 23rd & 24th available week days are still plentiful if your lucky enough to be able to take advantage of these we have partly booked dates for walk on anglers for 26th October & November 1st 8th 12th 19th 22nd. if you want a different date give us a ring or check out our web site.